At Luxivair SBD, our amenities are precisely focused on the varied needs of our customers. Set against the backdrop of the striking San Bernadino Mountains, all features and amenities are designed to deliver an elegant and innovative experience. experience. From areas where aviation personnel can relax and socialize, to amenities that support all of your business needs, Luxivair SBD is a destination that’s quickly gaining favor among discerning general aviation users. Below is an overview of the amenities we offer. 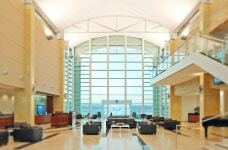 Pilots who are laying over can enjoy our state-of-the-art pilot’s lounge. Equipped with a kitchenette, wide-screen television, dining table, leather recliners and office resources, it’s the ideal place to unwind. Looking for a convenient and modern location for your next meeting, without having to be in Las Angeles? The executive meeting room at Luxivair SBD boasts audio-visual equipment, connectivity to an integrated projector for seamless presentations and automatic window shades for precise lighting. A catering kitchen with convenient pass-through access allows staff to easily serve refreshments without interrupting your business meeting. You can observe your aircraft directly from our panoramic windows. A flight planning room with computers, internet access, and necessary office resources makes it the ideal location that pilots can use to plan the rest of their trip. The flight planning room is always well-lit and easy to access any time of the day or night. Recharge your batteries in comfort and quiet in our appointed snooze rooms. With freshly-laundered linens and quiet relaxation before waking up refreshed and ready to head out on the next leg of their trip. Filled with the latest in exercise equipment, the Luxivair SBD fitness room enables busy aviation personnel and passengers meet their fitness and wellness goals. A unique view of aircrafts as they land and depart provides the motivation to walk, step and/or run to stay in shape. At Luxivair SBD, the concierge staff is what makes us very different. Our attentive, personable and professional staff strive to provide service that is backed by a range of options designed to make life easier for pilots, aviation personnel, support staff, and passengers. Needing a courtesy car, shuttle service or car rental can expect to receive these, as well as any other services, delivered by our staff that is focused on your comfort. Our theater at Luxivair SBD includes a 72-inch wide-screen television and surround sound stereo system. Relax in the overstuffed leather recliners and feel the stress melt away. Our spacious hangars provide short-term and overnight storage for a variety of aircraft both large and small. Please call us for more information. The open-air lobby signals the upscale and modern environment that awaits all who enter. The two-floor atrium’s ceiling connects with panoramic windows that meet the ground at both ends of the lobby. Underfoot are beautiful travertine floors. The open-air design of the lobby provides a smooth flow to the room while ensuring that everything is easy to reach. There’s no better way to view the San Bernardino mountains than from our outdoor lounge. With unparalleled views of the airport, the lounge also offers the magnificent Sand Bernardino Mountains as an impressive backdrop. Unwind after a long flight or host a business meeting while enjoying the beautiful California weather and sunshine. Nowhere else will pilots, aviation businesses, and personnel find the services and amenities they need to meet their goals of growth and relaxation than at Luxivair. Contact them today for more information.